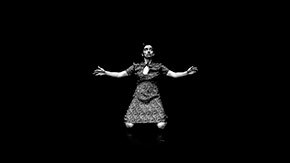 "This Dance Has No End" is a dance dedicated to performance artist, drag king and gender activist Diane Torr who passed away on the 31st of May 2017. Exactly one year after her death, I stand inside a black room and dance in silence. A single shot, a single dance, a fusion of male and female energy, an improvised ode to life and death. The instant composition is inspired by an urban traditional dance, called zeybekiko, rooted in the Middle East and originally danced only by men as solo improvisation. Here it is s danced by a hybrid manifestation of myself, a fusion of the female and male aspects that forms my identity...In silence I can still here Diane's voice speaking about owning the space: "You need to take space with all your being. Own the space". I lift my arms and I start dancing like there is no tomorrow. The camera follows without invading my personal space. The dance is not edited in post-production because the aim is not to "please"and "excite" the eye of the viewer but to invite a collective listening and owning of the space.